In order to make this course as accessible as possible, we have created flexibility in how participants book their place. If at the start of the week (Monday) you are not available please contact the Centre so you can transfer to the next suitable date. We can then offer your place to next on the waiting list. If you do not cancel and do not turn up you will lose your night. Participants will need to use up any outstanding nights by Thursday, 13th September 2018 when the last evening session takes place. Our ‘First Step Guided Sea Kayaking Evenings’ will run every Thursday evening from 3rd May through to 13th September 2018 (except 12th July). 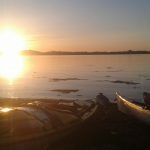 These evenings are aimed at newcomers and are an ideal way to get a taste of what Strangford Lough has to offer paddlers. 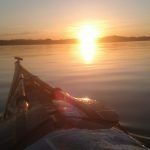 The philosophy behind the evening paddles is providing the opportunity for people to gain access to the lough and to enjoy a guided journey among the islands. We will be stopping off on an island for a picnic supper enjoying the wildlife, sunsets and spending time away from it all in a soothing relaxed environment – what more could you ask for mid-week? Providing coaching is not the focus of the evenings but our staff are more than happy to provide coaching in the form of ‘hot tip and handy hints’ as we journey. We select our weekly launch site on a Wednesday lunchtime when we have gained the most up to date forecast this will be communicated to you by email or by mobile. 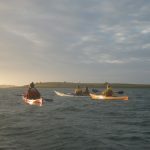 These ‘First Step Guided Sea Kayaking Evenings’ are aimed at those people who are looking at giving sea kayaking ago for the first time; or those people looking to get back into a boat after an extended break. Also if you are considering buying a boat, then these evenings are an ideal opportunity to try out a range of boats before purchasing. An email will be sent the day before (Wednesday afternoon) advising of the meeting point. Off water approximately 9.30pm, load boats and depart. Our equipment stores are by far the best around with a stock of over 25 specialist sea kayaks plus three doubles so there are plenty to choose from. All you will need to bring is old footwear for the water, a long sleeves top and/or warm fleece for under your wetsuit and towel/toiletries. Also bring a warm hat, warm top to carry in your boat and small snack and drink for a picnic on an Island. Participants are encouraged to bring any personal equipment so they get the opportunity to be coached using the equipment they are most familiar with. Guided Sea Kayaking Evenings’ includes kit, equipment, guiding and tea/coffee and one of our famous chocolate brownies or flapjacks.